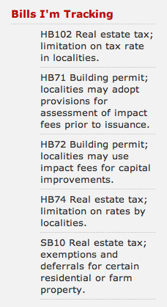 Things like impact fees on developments, qualifications of assessors and appraisers, tax credits for energy efficient or Earthcraft houses, exemptions for wells on properties under three acres, limitations of property tax rates, suspending water hook-ups during certain emergencies (the potential for abuse on this one seems particularly likely, and would definitely impact the real estate market), not to mention the Dillon Rule, and also whether or not you could use your fireplace if you lived in a densely-populated area, or whether you can give your 17 year old kid a glass of wine. Simply put, knowing that there may be a tax credit for energy efficient houses makes me better able to represent my clients. Knowledge and information are power; being able to efficiently manage that information is equally powerful. If you scroll down, you will see this new sidebar addition, showing the bills in the Virginia General Assembly that I am watching. Courtesy of Richmond Sunlight, you too can track bills that affect you in the General Assembly; go to the new Photosynthesis page here. I wonder if this could develop into a social network of people tracking bills, maybe even become a Facebook widget. If we leave politics up to “everyone else,” we are doing ourselves a disservice. Thanks for the Bill Tracking feature. It would probably take me days to find those on my own.